What is Sustainable Development, and how does it differ from Green Development? Sustainable development (SD) is a pattern of resource use, that aims to meet human needs while preserving the environment so that these needs can be met not only in the present, but also for generations to come (sometimes taught as ELF-Environment, Local people, Future). The term was used by the Brundtland Commission which coined what has become the most often-quoted definition of sustainable development as development that “meets the needs of the present without compromising the ability of future generations to meet their own needs”. Sustainable development ties together concern for the carrying capacity of natural systems with the social challenges facing humanity. 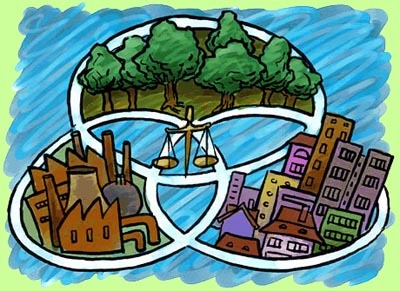 As early as the 1970s “sustainability” was employed to describe an economy “in equilibrium with basic ecological support systems.” Ecologists have pointed to The Limits to Growth, and presented the alternative of a “steady state economy” in order to address environmental concerns. The field of sustainable development can be conceptually broken into three constituent parts: environmental sustainability, economic sustainability and sociopolitical sustainability. Green development is generally differentiated from sustainable development in that Green development prioritizes what its proponents consider to be environmental sustainability over economic and cultural considerations. Proponents of Sustainable Development argue that it provides a context in which to improve overall sustainability where cutting edge Green development is unattainable. For example, a cutting edge treatment plant with extremely high maintenance costs may not be sustainable in regions of the world with fewer financial resources. An environmentally ideal plant that is shut down due to bankruptcy is obviously less sustainable than one that is maintainable by the community, even if it is somewhat less effective from an environmental standpoint.